Brett Harper is a former Solouki group Postdoctoral Scholar in the Department of Chemistry & Biochemistry at Baylor University. He completed his bachelors at Baylor University in May 2012 with a B.S. in Biology and a minor in Chemistry and his Ph.D. at Baylor University in May 2016 in Biomedical Studies. Brett lived in Fort Worth, Texas, before coming to Baylor University. He joined the team in January 2012 as an undergraduate student and stayed with the group for his graduate and postdoctoral studies. “I see the development of sound scientific practices in cutting edge fields (such as mass and ion mobility spectrometry) as essential for the growth and development of communities and economies. Therefore, one of my long term goals is to help train and equip scientists in third world and developing countries, with a specific focus on communities in equatorial Africa, with skills and equipment which are currently lacking or even non-existent. I have seen firsthand the effects of poor healthcare and scientific development. For example, in Uganda I encountered ailments ranging from elephantiasis (from lymphatic filariasis) to untreated goiter and maxillofacial tumors. Most of these disorders could have been easily detected and treated prior to development of any symptoms but were not treated due to lack of technology and healthcare infrastructure. I believe that mass spectrometry and allied techniques are essential tools to diagnose and characterize disease process and treatments in both developing and developed nations. Therefore, the focus of my research is on developing methods to rapidly and accurately characterize the identity, structure, and conformations of biomolecules such as proteins/peptides, DNA, pharmaceuticals and biologics, sugars, and whole cell extracts. “In order for mass spectrometry to be readily utilized for field analysis, instrument components must be portable, cheap, easy to use, and consume little-to-no power. Based on results from electrospray ionization (ESI) and sonic-spray ionization (SSI) I decided to develop an easy to use atmospheric pressure ionization technique utilizing a disposable spray pump bottle (similar to methods used in early ion mobility studies prior to the development of ESI). We have tested technique (called spray pump ionization (SPI)) on time-of-flight and Orbitrap systems and generated reproducible signals simply by spraying the sample in front of the atmospheric pressure inlet. While advantageous for portable systems, the technique has lower sensitivity than other ionization techniques. Data presented from this project was awarded the first-place poster prize at the Pan Africa Chemistry Network (PACN) conference in Nairobi, Kenya in November of 2015. 1. Harper, B., Neumann, E. K., Stow, S. M., May, J. C., McLean, J. A., Solouki, T. “Determination of Ion Mobility Collision Cross Sections of Unresolved Isomeric Mixtures Using Tandem Mass Spectrometry and Chemometric Deconvolution.” Analytica Chemica Acta 2016, 939, 64-72. 2. Brantley, M., Pettit, M., Harper, B., Brown, B., Solouki, T., “Automated Peak Width Measurements for Targeted Analysis of Ion Mobility Unresolved Species.” Analytica Chemica Acta 2016, 941, 49-60. 3. Pettit, M., Harper, B.,Brantley, M., Solouki, T., “Collision-energy Resolved Ion Mobility Characterization of Isomeric Mixtures.” Analyst 2015, 140, 6886-6896. 4. Harper, B., Neumann, E. K., Solouki, T. “DNA Oligonucleotide Fragment Ion Rearrangements Upon Collision-induced Dissociation.” Journal of the American Society for Mass Spectrometry2015, 26(8), 1404-1413. 5. Brantley, M., Zekavat, B., Harper, B., Mason, R., Solouki, T. “Automated Deconvolution of Overlapped Ion Mobility Profiles.”Journal of the American Society for Mass Spectrometry2014, 25(10) 1810-9. 6. Harper, B., Miladi, M., Solouki, T. “Loss of Internal Backbone Carbonyls: Additional Evidence for Sequence-scrambling in Collision-induced Dissociation of y-Type Ions.” Journal of the American Society for Mass Spectrometry 2014, 25(10), 1716-1729. 7. Miladi, M., Harper, B., Solouki, T. “Evidence for Sequence Scrambling in Collision-Induced Dissociation of y-Type Fragment Ions.” Journal of the American Society for Mass Spectrometry2013, 24(11), 1755-1766. 3. 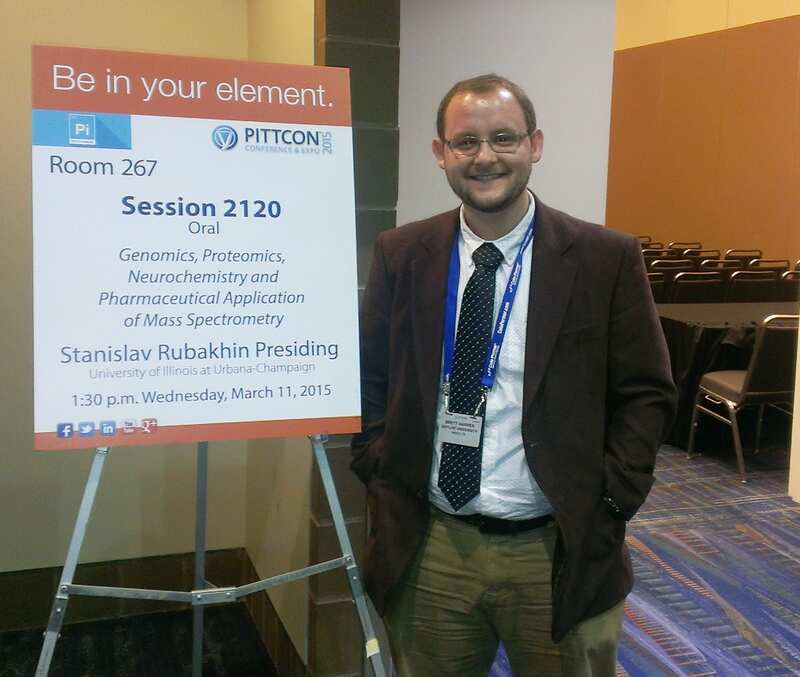 Harper, B.; Neumann, E. K.; Solouki, T. “Improving Sequence Coverage of Ion Mobility Unresolved Peptide Isomers Using Chemometric Data Deconvolution” Pittsburgh Conference, 2015, New Orleans, LA. 4. Harper, B.; Miladi, M.; Zekavat, B.; Solouki, T. “Advanced “X-Omics” Research” Enhancing Research Through Collaboration Retreat, 2013, Waco, TX. 3. Harper, B.; Brown, B.; Solouki, T. “Rapid Profiling of Cellular Extracts Using Ion Mobility-Mass Spectrometry.” 64th Annual American Society for Mass Spectrometry Conference, 2016, San Antonio, TX. FIRST PLACE PRIZE! 4. Brantley, M.; Pettit, M.; Harper, B.; Brown, B.; Solouki, T. “Peak Width Analysis for Automated Detection of Unresolved Isomers in Ion Mobility.” 64th Annual American Society for Mass Spectrometry Conference, 2016, San Antonio, TX. 5. Harper, B.; Neumann, E. K.; Solouki, T. “Extracting Collision Cross-sections of Ion Mobility Unresolved Isomers using Tandem Mass Spectrometry and Chemometric Deconvolution.” Proceedings of the 63rd ASMS Conference on Mass Spectrometry and Allied Topics, 2015, St. Louis, MO. 6. Pettit, M. E.; Harper, B.; Brantley, M. R.; Solouki, T. “Collision-Energy Resolved Ion Mobility Deconvolution of a Ternary Isomeric Mixture” Pittsburgh Conference, 2015, New Orleans, LA. 7. Harper, B.; Lochridge, J.; Solouki, T. “Spray Pump Ionization Mass Spectrometry of Pharmaceutical, Peptide, and Protein Ions” Pittsburgh Conference, 2015, New Orleans, LA. 8. Harper, B.; Brantley, M.; Pettit, M.; Solouki, T. “Automated Collision Cross Section Calculation for Traveling Wave Ion Mobility Spectrometry Instruments” Proceedings of the 62nd ASMS Conference on Mass Spectrometry and Allied Topics, 2014, Baltimore, MD. 9. Harper, B.; Zekavat, B.; Brantley, M.; Pettit, M.; Solouki, T.“Energy Resolved Ion Mobility Deconvolution of Isobaric Compounds” Proceedings of the 62ndASMS Conference on Mass Spectrometry and Allied Topics, 2014, Baltimore, MD. 10. Harper, B.; Neumann, E. K.; Olaitan, A. D.; Solouki, T. “Sequence-scrambling in Collision-induced Dissociation of Oligonucleotides” Proceedings of the 62ndASMS Conference on Mass Spectrometry and Allied Topics, 2014, Baltimore, MD. 11. Zekavat, B.; Harper, B.; Brantley, M.; Pettit, M. E.; Solouki, T. “Use of Multivariate Curve Resolution and Ion Mobility-Mass Spectrometry for Isomer Differentiation” Proceedings of the 62nd ASMS Conference on Mass Spectrometry and Allied Topics, 2014, Baltimore, MD. 12. Harper, B.; Miladi, M.; Solouki, T. “Evidence for y-type fragment ion rearrangement through loss of internal backbone carbonyl upon collision-induced dissociation”69th Southwest Regional Meeting of the American Chemical Society, 2013, Waco, TX. 14. Harper, B.; Zekavat, B.; Solouki, T. “Human Neutrophil α-Defensins as Potential Stress Biomarkers” Baylor University Summer Undergraduate Research and Scholarly Achievement, 2012, Waco, TX. 15. Harper, B.; Miladi, M.; Zekavat, B.; Solouki, T. “Probing the Effect of Primary Structure Variance on the Gas-Phase Conformations of Insulin and Lispro” 61st Annual American Society for Mass Spectrometry Conference,2013, Minneapolis, MN. 16. Miladi, M.; Harper, B.; Solouki, T. “Sequence Scrambling in Collision-Induced Dissociation of y-Type Fragment Ions” 61st Annual American Society for Mass Spectrometry Conference,2013, Minneapolis, MN.